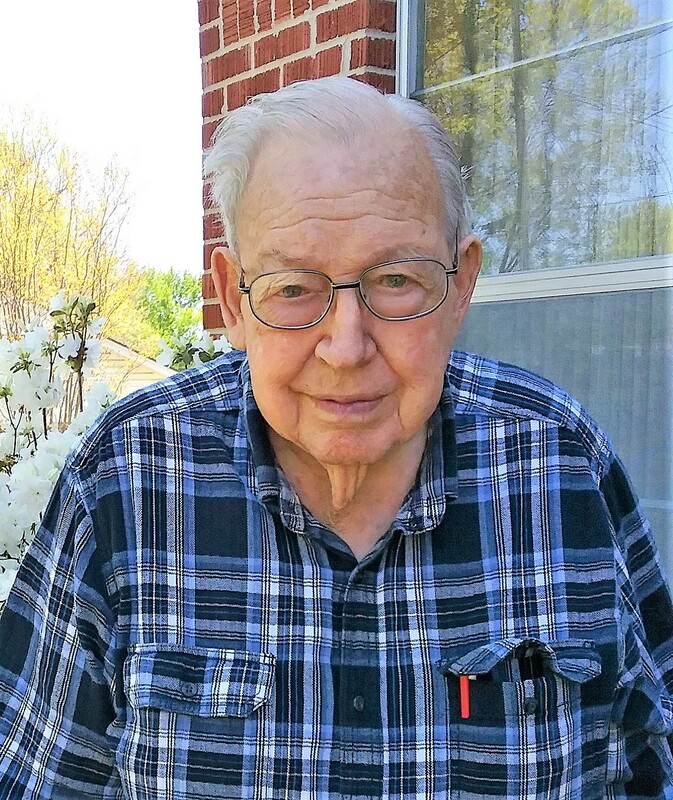 William David Doering, 92, of Muskogee, Oklahoma went to his Heavenly Home on Thursday, January 31, 2019. He was born on May 5, 1926 to Edward Emil Doering and Bertie Lee (Perkins) Doering in Muskogee, Oklahoma. Bill attended Washington Elementary and graduated from Muskogee Central High School. Bill married the love of his life, Jolene Hill, on March 1, 1952 at Boston Avenue Baptist Church. They shared over 62 years of a happy life and marriage together. Bill was a supervisor in the decorating department at Brockway Glass where he worked for 43 years and retired in 1990. He was a longtime member of Boston Avenue Baptist Church in Muskogee and also a member of Brockway Bees Bowling League. Bill was a hardworking man and was always “Mr. Fix It”. He was ruthless when it came to playing checkers, pitch or dominoes. Bill adored his family and loved taking care of them. He thoroughly enjoyed spending as much time as possible with them. Bill will always be remembered as a loving father and a kind, gentle man. He was preceded in death by his parents; sister, Helen Lee Brown; brother, Jimmy Doering; niece, Marilyn H. Bronaugh; and sister-in-law, Edna Doering. Bill is survived by his daughters, Christina Bill (Doering) Boyd and husband Rick of Collinsville, OK, and Jill (Doering) Perkins and husband Tim of Lequire, OK; grandchildren, Corey and Kristy Perkins of Ashdown, AR, Lauren and Brand Reichard of Lynchburg, VA, and Jessica Perkins of Enid, OK; great-grandchildren, Killian and Selah Reichard both of Lynchburg, VA; nephews, David Brown of Fort Worth, TX, William and Janey Brown of Lawton, OK, Mike and Alma Brown of Fort Gibson, OK, and Tommy and Deb Doering of Guadalupita, NM; special niece, Tracy Fenton and husband Mark; many other great-nieces and nephews, and their families; several in-laws and their families of the Hill Bunch, Page and Moses families; his church family; his Brockway Glass family; and his many friends. A celebration of Bill’s life will be 10AM, Monday, February 4, 2019 at Cornerstone Funeral Home Chapel with Rev. Donnie Echols and Rev. Timothy Perkins officiating. Interment will follow at Greenhill Cemetery with Jason Hill, Joel Hill, Seth Hill, Jordan Hill, Corey Perkins and Mark Fenton serving as pallbearers.